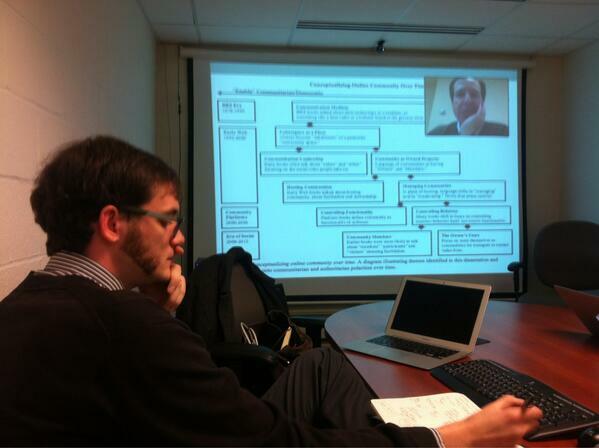 I defended my dissertation today. If you’re at all interested you can read the draft I defended here. While it The event brings to the end about 23 years of continuous education. (I’ve been working full time for the last seven of those, but nonetheless, going to school for the last 23 years.) While it was accepted as is, I am still going to be doing some format tweaking and copyediting as it goes through its process to get its final signatures. 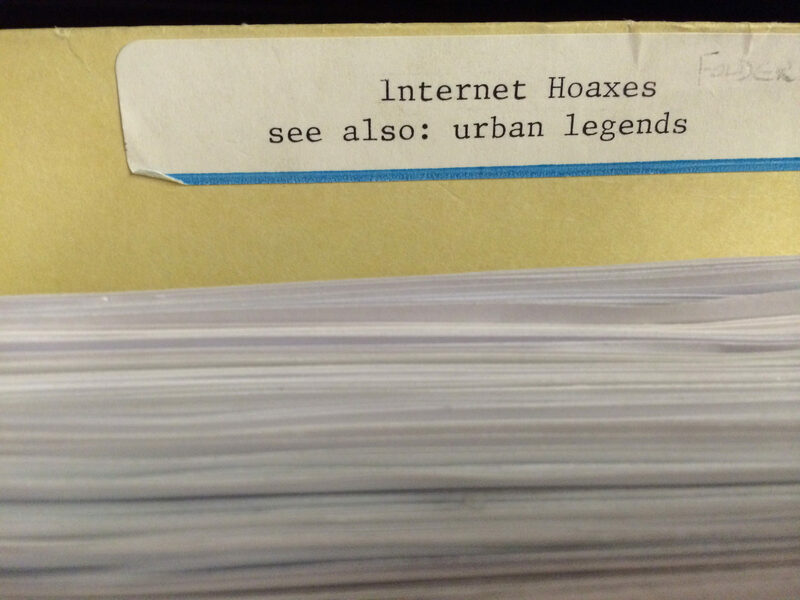 Ultimately that final version will go into GMU’s digital repository. With that said, several folks were interested in reading the draft as it is now, so I figured I would share it here. The diagram below is, by and large, the crux of the argument I ended up developing in the dissertation. 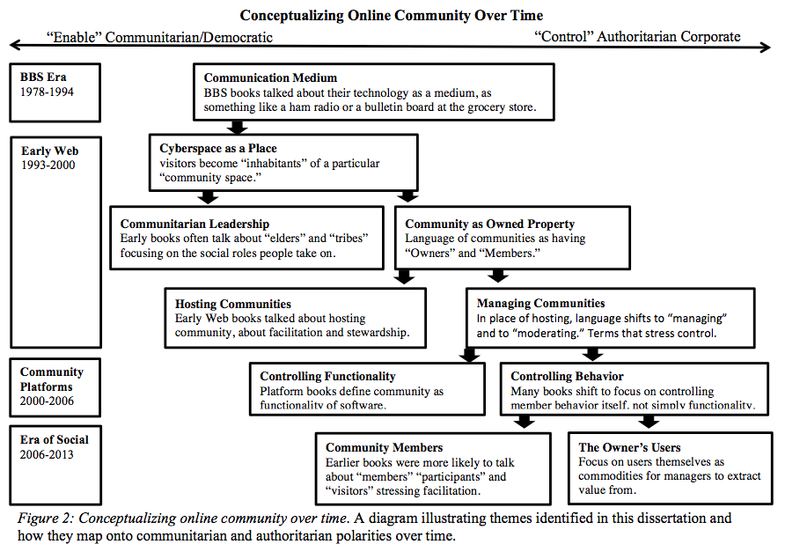 For the most part, ideas of online community shift toward a communitarian set of language focused on electronic democracy in the early Web. That utopian vision is further and further undercut as it turns into a discourse of permission and control. The features of early online discussion systems harden into platforms like phpBB and vBulletin and ultimately pave the way for elaborate reputation systems in social networks. It’s a lot more complicated than that, so read the dissertation if that sounds interesting. Abstract: Discussion on the Web is mediated through layers of software and protocols. As scholars increasingly study communication and learning on the web it is essential to consider how site administrators, programmers, and designers create interfaces and enable functionality. The managers, administrators, and designers of online communities can turn to more than 20 years of technical books for guidance on how to design online communities toward particular objectives. 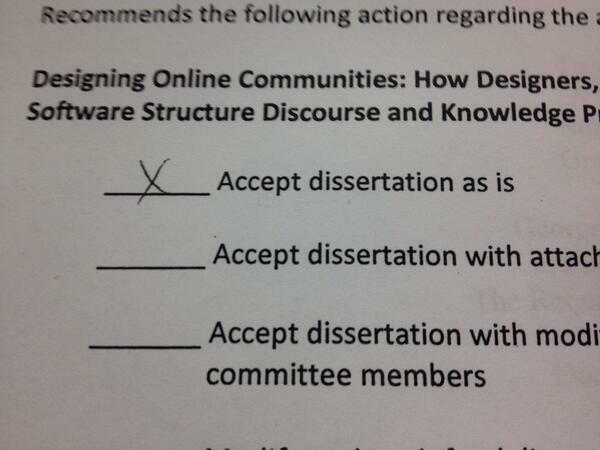 Through analysis of this “how-to” literature, this dissertation explores the discourse of design and configuration that partially structures online communities and later social networks. Tracking the history of notions of community in these books suggests the emergence of a logic of permission and control. Online community defies many conventional notions of community. 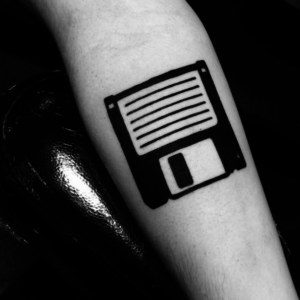 Participants are increasingly treated as “users”, or even as commodities themselves to be used. Through consideration of the particular tactics of these administrators, this study suggests how researchers should approach the study and analysis of the records of online communities. Congratulations on finishing and defending your dissertation! I know what an enormous effort that is and hope you are now enjoying the biggest feeling of relief of your life! Thanks for this important contribution to the field; I look forward to learning from it. Congratulations, Dr. Owens. You have done well. Life begins anew as you continue your lifelong learning quest. Congratulations, Dr. Owens! Delighted to learn the great news. 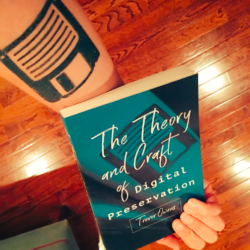 Drop me a line–would love to chat about a digital “take” on medieval science. Thanks Mike! Hearing from you totally made my day. Flashes back to getting ideas for what courses to take as an undergrad and the thoughtful letter you wrote for me for one of those ILS fellowships. I’ll follow up with you in an email.